For QSFP+ formfactor there are different variants. The main difference between Q.1640G.x and Q.85/1340G.x is the connector type. 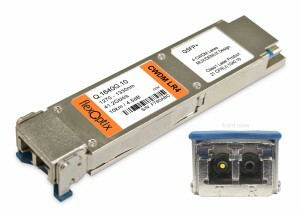 QSFP+ like Q.1640G.x do have an integrated CWDM Mux/Demux which multiplexes all 4 lanes to only one fiber. This gives the ability to use a LC-Duplex connector with a standard Multimode- or Singlemode-Fiber. 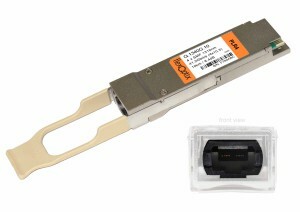 QSFP+ with MTP/MPO connector are more price sensitive. There is just a cabling with MTP/MPO cables needed. 1 x 900nm LC BIDI for Multimode is hot! 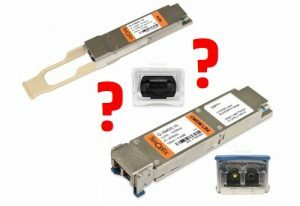 Note: a QSFP+ LR4 is interoperable with a QSFP+ LR4. I didn't mention this in the columen "interoperability" for a better overview. This applies to all other types as well. * Juniper enables for their QFX-QSFP-40GE-ESR4 also 4 x 10G operations - to split up one QSFP+ port in 4 dedicated 10G ports (credits go to Tom Eichhorn for working tirelessly on the QFX tests). The same applies for Brocade. For this kind of operation they defined a special article/partnumber 40G-QSFP-SR4-INT. From a technical point of view this "split operation" is possible with all QSFP+ mentioned above. QSFP+ get always 4 x 10G from the host on the electrical side. Only the programming of the transceiver needs to be adapted for the host. On the optical path you have to check how to split up the signal in 4 dedicated 10G lines. For the ones with MTP/MPO receptacle this is not a problem with Breakout-cables.